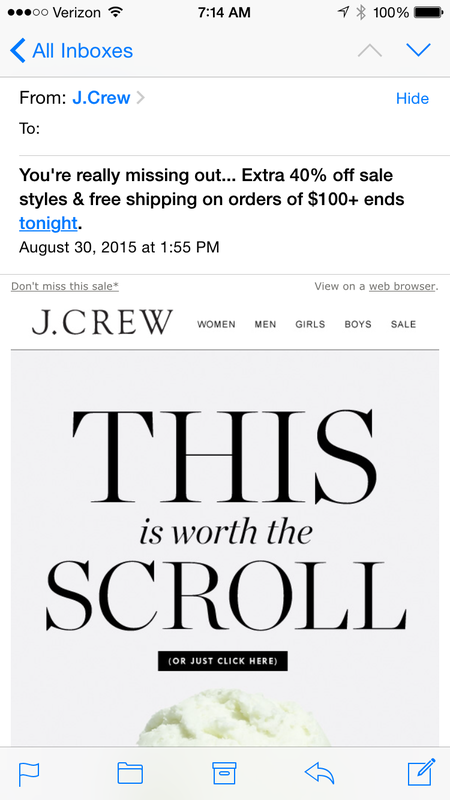 When designing an email it’s important to keep “the fold” in mind. In other words, get your message across in the small space the subscriber will see without needing to scroll. If you can’t squeeze your information into that small area, give them a REASON to scroll. I don’t know if I should file this email under “oops” or “genius.” Lol. I had to scroll just to make sure. Subject Line: You’re really missing out… Extra 40% off sale styles & free shipping on orders of $100+ ends tonight. I was enticed, so I scrolled. I’ll give them points for originality, but in the end it wasn’t worth the scroll. The bottom of the email didn’t contain any new information. I expected to find some information about the promo? sale? new products? I was pretty sure they weren’t selling ice cream, but I had no clue what this email was about (aside from the subject line). Once I clicked through to the landing page and saw the copy “Summer Treat” and the promo code “saletreat,” the connection with the ice cream made sense. However, the email lacked context or a reason to click. I’m sensing a trend here. What better way to make someone feel like they’re getting the most bang for their buck than to offer a versatile garment that can be worn day after day? Here are three emails that highlight just that. 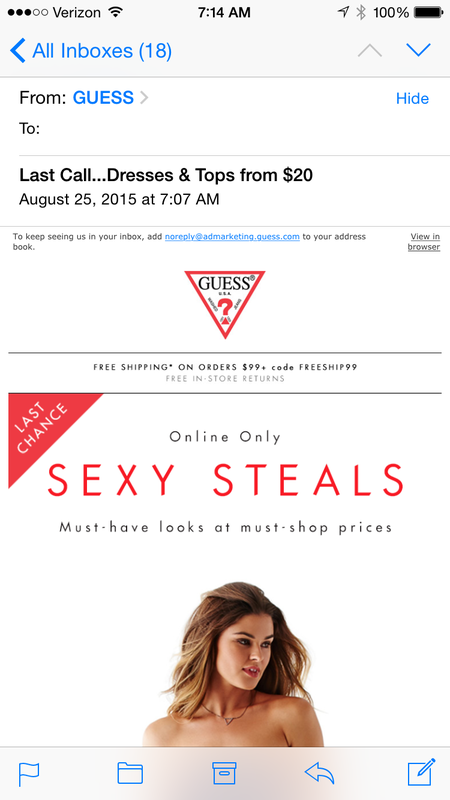 So which email design “wore it” best? Let’s evaluate. Subject Line: Our most versatile dress yet (+ free ship). I love this email’s outdoor photography (as opposed to studio) and the product pairings with each outfit. These two elements make the design most appealing and adds value by doing the tough “pairing” work for the subscriber. Not to mention that it offers the most opportunity for click-throughs. My only criticism is that none of the links take you to the featured product. Instead they go to the general category where you are forced to scroll to find the product. Even though their copy suggests that it might go to the category (tanks, shirt dresses and pullovers), the imagery and email topic sets another expectation. I would suggest either providing links for the product in addition to the category, or at the very least providing the name of the featured products. Banana Republic comes in a close second. While it has lots of things going for it, it doesn’t have as much versatility when it comes to product uses and pairings. Out of the three emails, it’s landing page was handled the best (although still not entirely ideal). It too only has a link to shop by the category. However, what makes it better than the others is that the product list begins with the featured dress. I’ve noticed two things that Target is doing nicely. First, they have been selecting products that coordinate in color for their sections. For example, in this email all the decor is teal, the electronics are silver, etc. Doing this makes the groupings aesthetically pleasing, feel as if they belong together, and helps to define the sections. Even the products in the recovery module are coordinated in Target’s signature red. Second, is their use of responsive coding, which best optimizes rendering for desktop vs. mobile. On a computer the email is significantly wider, with the hero image to the left and it’s related links to the right. Whereas on a mobile device the sections stack vertically. This makes the text and images larger on a small screen, therefore, easier to read and click. Subject Line: Psst! Save 30% on kids’ clothing. Ends today. Most people reading this already know what an email preheader is, but I’ll indulge myself anyway. The preheader is the small text found at the top of the design that summarizes the email’s most pertinent information. It’s there for two main reasons: 1) If the images don’t load, the viewer can easily see what the email is about and is able to click through 2) Some email clients will show the first few lines of the email’s text before opening the email. With this, the recipient can get a better idea about the contents of the message. Email still looming? View in browser. Email isn’t coming to life? View in browser. Email refusing to be categorized? View in browser. I love to see companies thinking outside the box and finding new ways to make something dull, fresh! I tip my hat to UncommonGoods. My only suggestion is to include a link to the call-to-action in the preheader as well. Preheater: Email refusing to be categorized? View in browser. Subject Line: They Walk! They Talk! Preheater: Email isn’t coming to life? View in browser. 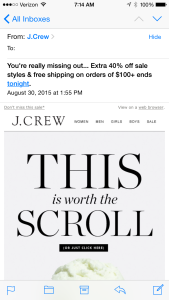 Preheader: Email still looming? View in browser. Sometimes the inbox can get pretty cut & dry with the same design formats regurgitated again and again. If you don’t work to set yourself apart, your email could get lost in the sea of messages. Here are a few designs that were really fun and attention grabbing. The hand drawn elements that support each product really make this email special. While some of the products may have gotten a bit lost in the drawings, it definitely got my attention and I took the time to find each item. This email drew me in right away with its bright complimentary colors and the invitation turned rocket ship. The fun continues with textured backgrounds separating each section and little side messages with arrows. I love the hand-written notes and the arrows pointing out specific design elements. The thumb tacks, curled up corners, shadows and layers help give this email a fun bulletin board feel. When you’re tasked to fit A LOT of products in an email, it’s tough to find a layout that will flow, draw interest and won’t overwhelm. Here are two design styles that I think pull it off quite nicely. I’m really drawn to this popular layout. Breaking away from the traditional grid, the staggered effect really draws your eye through the images and down the page. It has minimal text so it scans easily. Subject Line: Looking to update your bath? Start here with Free Shipping! Subject Line: It’s your move (our move: free ship). Subject Line: Last chance to save on outdoor furniture. Subject Line: Online Sneak Peek: Employee Discount Sale! This design method uses graphics in addition to product photography to create flow. Subject Line: Up to 55% Off All Uniforms + Get Back to School Essentials Starting at $2.99 + Extra 25% Off Savings Pass! I was immediately smitten with this design — the flow, the treatment with the numbers, the overlapping images… But when I saw the significance of the numbers, I was in LOVE. This email provided insightful information about the proper etiquette for when to send thank you notes, invitations and announcements. How cool is that! I want to file this email away and keep it for future reference. How can other companies add value similarly? A home decor store could give tips on arranging items on a shelf. A clothing retailer could share secrets about popular color pairings for accessorizing. In short, impart some wisdom to further your relationship with your subscribers. Subject Line: Don’t miss out on your special offer! I love emails that tell a story or put you in a setting outside of the ordinary. When I opened this gem from Banana Republic I was immediately transported to another country and into the sketchbook of a clothing designer! The use of photographs, designer sketches and hand-drawn lettering really brought this email to life. If I had seen those blue pants on a shelf at the store I would have walked right by them — but now, seeing them in the context of a chic foreign world they mean so much more to me. I simultaneously see these products in a whole new light AND want to take a trip to France. My only suggestion would be to add the same tone to the copy and subject line. Sending an email about a partner can be tricky. If your message is too off-brand, you might scare your subscriber away thinking it’s spam. If you’re unable to create a connection between the companies properly, you’ll leave them confused. Here are a few examples of partner emails I’ve received recently; some done right and some a bit off target. Here we have a home store (west elm) partnered with a company that mails doggy treats (BarkBox). I would imagine finding a similarity between these brands would be difficult, but this email did a great job bringing them together. It’s clearly west elm branded with header and prominent logo so there’s no confusion who the email came from. They perk interest and tie the brands together by creating a contest held in west elm stores: Snap a photo of your dog in our stores, Instagram it, and you’ll be entered to win a BarkBox. Nicely done. Next we have a clothing retailer (LOFT) partnered with a company that provides horoscopes (Saturn Sisters). On the upside, I was able to tell who the email came from, but the tie-in between the companies left me puzzled. Rather than using the copy to explain the connection, it mentions coffee, twice. I thought maybe the landing page would bring it together somehow, but it didn’t. Furthermore, the landing page didn’t work for mobile and the email was missing the legal footer (not to mention a link to unsubscribe to partner emails). My suggestion for a quick solution would be to revise the wording both on the email and landing page. For the landing page, if the fortune was to take time to yourself, suggest or show a picture of some LOFT lounging pants; if it’s to embrace your wild side, link to some brightly patterned tights. I did enjoy the animation in the email and they did get a click from me, but there was so much missed opportunity and a bit of disconnect. The final example comes from a company that sends digital invitations (Evite), partnered with a self-tanning lotion brand (Sally Hansen). Now that’s a reach to find common ground. 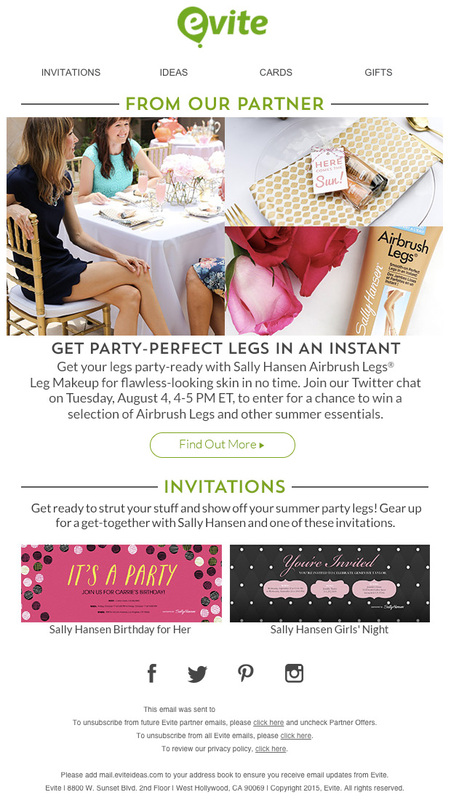 On the up side, the email has the evite logo, a title that clearly states “from our partner,” and copy that (miraculously) was able to draw a connection between the brands: have great tanned legs at your next party. But, despite all of that, at first glance I thought this email was spam. My suggestion would be to include a bit more imagery from the evite side of the partnership — maybe more of the header from the evite website. Perhaps they could also work an invitation into the design — a “Best Legs Bash” invitation? Love Email Humor. Or Don’t. This email is so much fun from top to bottom! The Moosejaw standard gummy worms in the header sets the tone for the email. I adore the drawings with each backpack; they help to give each item its own story, draw attention and just make it all-around fun! I have to say my favorite was the garden gnomes. Next we get to the secondary message — a zebra in socks? How cute and unique is that, amirite? Then they finish it off with their standard social media footer which I have loved since the first time I saw it: “Check us out. Or don’t.” You know, no pressure. If you take a closer look at the small print you’ll find gems like the links “How’s my hair?” and “A picture of a giraffe.” Also in the legal footer, ”If someone forwarded you this email and you don’t absolutely hate it…” Nice job, Moosejaw — keep the smiles coming!